When I taught theology, the doctrine my students found most offensive was neighbor love. The idea that you are obligated to love the person right next to you, regardless of anything they might have done to “deserve” your love, was patently absurd to them. In class, several students asked if there was a society doesn’t put a high value on work. I mentioned Medieval Europe. This was stupid on my part. Now, it’s true that when Pieper imagines a society that values work and leisure properly, that’s what he’s thinking about. It’s also true that Medieval Europeans worked many fewer days than we do; their calendar included numerous religious holidays, on which labor was forbidden. But of course, they did not enjoy a high standard of living. The reason for that isn’t their laziness, however. Their economic system and technology kept their work from being very productive. I wished I had been quick enough on my feet to make a good case that you don’t have to become a Medieval peasant to adopt Pieper’s outlook. So I stayed up late one evening, when I should have been doing leisurely reading before bed, making charts that aim to show that it’s possible to work somewhat less than Americans do and still enjoy a high standard of living. I shared them with the students; now I share them with you. All the data on the subsequent charts comes from the Organization for Economic Cooperation and Development (OECD), a group of the world’s richest countries. In each chart, the U.S. is marked in a contrasting color. In each chart, it’s an outlier. 1. U.S. workers put in more hours per year than most of their wealthy peers in OECD countries. The U.S. has the fifth-highest per capita GDP in the OECD, behind the relatively small countries of Luxembourg, Ireland, Norway, and Switzerland. 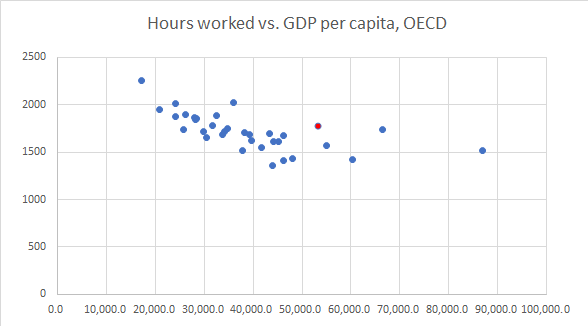 But Germany, France, and the U.K. are all both large and wealthy and thus make for good comparisons with the U.S. People in those countries all work a lot less than their American counterparts do. Germans work 430 fewer hours per year on average. The French work 360 fewer, and people in the U.K. work 100 fewer. 2. U.S. workers have no guaranteed paid time off; workers in peer countries’ get a month or more. Much of that time off in Germany is required by law. While most OECD countries require employers to provide 20 or 25 days’ vacation annually, the U.S. is the only one that doesn’t require any. The previous chart suggests that, if anything, the richer a country is, the less its residents work. 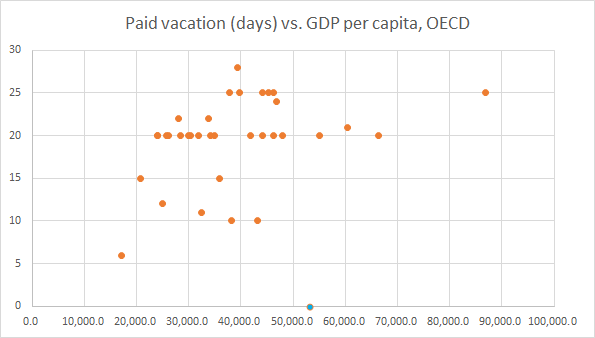 In this one, it’s clear that there’s no correlation at all between paid time off and national income. I shouldn’t have brought up Medieval Europe. I should have talked about present-day Europe. That’s where leisure is valued but living standards are high. 3. U.S. mothers have no guaranteed paid maternity leave; most mothers in other OECD countries get at least three months. The U.S. is very prosperous, but we don’t use our prosperity to buy ourselves more leisure time. We don’t even use it to buy paid time off for new mothers. Now, raising a newborn is hardly leisure. (Though I’ve also argued there are problems with calling it work, too. We need a broader vocabulary.) The point here is that it’s possible to value things other than work in a prosperous country. 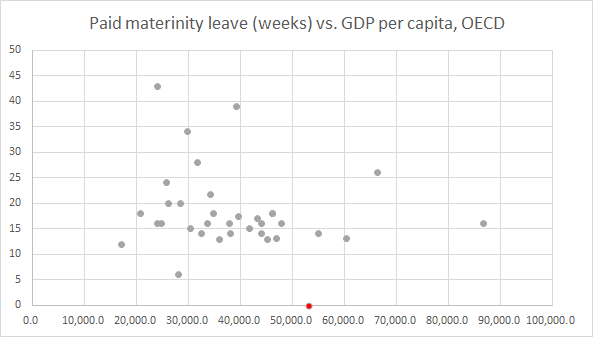 Other rich countries place enough value on raising young children that they make it possible for mothers (and, often, fathers too) to take time off from work without sacrificing their entire income. These charts suggest there are other ways to build a prosperous society besides adopting the Total Work mindset. Why don’t we Americans? Why is work so important to us? I hope to read some good answers in my students’ papers. I’m a writer and a former professor and parking lot attendant. I cover work, religion, and education, and I’m currently writing a book about the spiritual costs of the American work ethic.This post is reprinted from my newsletter. Subscribe here! Image: Jon Malesic.